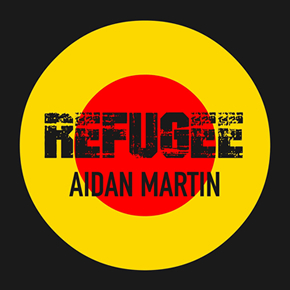 Aidan Martin’s latest music video, Refugee is the title track and first release off his highly-anticipated second blues-rock album coming up later this year. Refugee is a powerful departure point for the upcoming 10-track album. In accordance with the track’s sentimental theme and lyrics, ‘We all need a place to rest our head’ – the opening scene of the video presents the trio of runaways in search of a place of refuge. The underlying theme also conveys the narrative of finding a suitable space to be oneself, finding one’s fit in modern society – similar to how the rock ‘n’ roll genre grapples with its ever-shrinking place in the sun – the local and international music market. But, rock ‘n’ roll is very far from dead. With quality rock acts such as Aidan Martin on the scene, a determined attempt to keep this genre alive and well is about to pay off. Aidan is always searching for that honesty and meaning, for a place to call home and for a sound to make his own. It is this yearning that propels Aidan to continue his never-ending quest to make music that matters. Refugee was produced by Michelle Swart who teamed up with screenwriter and director Marlida Ferreira. The music video was filmed and expertly edited by Hannah Zkukovina. The single is now also available from iTunes. In a time when audiences are seeking the next big thing by scrolling through their social media feeds, it has become increasingly hard to find a band that is authentic and professional, one that breathes groovy blues and plays to the soul of rock. The Aidan Martin Band, with Aidan Martin on vocals and guitar, Jorik Pienaar on drums and André van der Merwe on bass, does exactly that, staying true to who they are while consistently producing music that is rooted in Rock ‘n’ Roll. Expect the heartstrings being tugged one moment and the beat waking up the good old rock soul the next, when listening to this powerful group. It’s 2016 and because of Aidan Martin, rock is alive and well and living in South Africa.